Manchester City midfielder Ilkay Gundogan has revealed the tactical message from his manager Pep Guardiola as he was brought on against Manchester United. The Germany international ended up scoring the third goal to kill the game, with City winning the derby 3-1 in the end. Not normally a prolific scorer, Gundogan has a decent record in this fixture, having also netted in last season’s 3-2 home defeat to United. 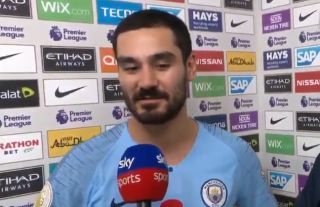 Watch below as Gundogan explains he was mainly brought on to help City keep the ball more in the closing stages, but also to exploit the spaces opening up as United chased the game. ‘He told me to keep the rhythm high and use the spaces,’ he told Sky Sports. Ilkay Gundogan and Sergio Aguero reflect on Manchester City's 3-1 win over Manchester United.